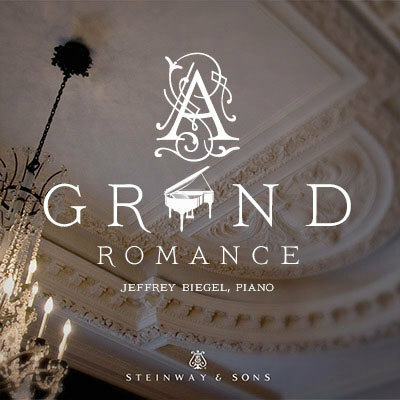 A Grand Romance celebrates the intimacy of the relationship between pianist and public, with a sampling of finely honed pieces of the Romantic era. Penned by composers who were highly accomplished keyboardists themselves, it represents a genre of pianism unashamed of sentiment, frill and facility, and luxuriating in the expressive sophistication of the instrument and the wooing of the crowd. The Steinway & Sons label was launched with Jeffrey Biegel's critically acclaimed release, Bach On A Steinway, in 2010; Biegel's recording of A Steinway Christmas Album was one of the top selling classical titles of 2011. In the days before piano recitals became Serious Business, Romantic virtuosos delighted audiences by serving up lighthearted encores where technical fireworks and effortless charm went hand in hand. At first the prospect of hearing 16 such pieces in a row struck me as akin to having nothing but candy for dinner, yet Jeffrey Biegel’s excellent programming instincts and canny sense of pacing manages to transform what the late Arthur Loesser called “cream of corn” into real sustenance. More importantly, he takes the texts seriously without losing sight of their entertainment value. In the Moszkowski selections, for example, he eschews cuts in the Caprice espagnol, plays Étincelles’ understated ending as opposed to Horowitz’s rewrite (although Biegel sneaks in a few flourishes of his own! ), and elegantly passes the tunes back and forth between hands in La jongleuse. He dispatches Henselt’s treacherous double notes in “Si oiseau j’étais” rapidly, effortlessly, smoothly, and with little pedal, much as Rachmaninov did in his classic recording. By contrast, Biegel treats Mischa Levitski’s Valse in A major with more languor and lyricism than in the composer’s terser reading. The opposite is true with Paderewski’s B-flat major Nocturne, where the composer’s yielding, wistful lyricism differs from Biegel’s drier, more urgent shaping of the left-hand accompaniment. While it’s good to hear the full version of Anton Rubinstein’s Rêve angélique, I find Biegel’s interpretation a shade careful and studio-bound, lacking the floating animation of Harold Bauer’s ancient shellac recording. I also find Biegel’s minuscule rhythmic delays in the Schulz-Evler/Strauss Blue Danube’s main tune a bit studied and predictable, in contrast to his heartfelt and musically compelling rubatos in the slower sections. Among modern recordings of this celebrated transcription, I prefer Marc-André Hamelin’s more forceful, sweeping bravura. Biegel concludes his program with a vivacious performance of Abram Chasins’ once-popular Rush Hour in Hong Kong. My little quibbles do not lessen the positive impact that keyboard lovers surely will glean from Biegel’s impressively finished, communicative, and joyful pianism, not to mention the excellent annotations and sonics. The works themselves, an array of salon pieces and showpieces, are expertly crafted and full of sweet melodies. They sometimes allow Biegel to sport his dazzling virtuosity, as in the case of Schultz-Evler’s arrangement of The Blue Danube, but the pianist never gives himself over to the temptation of upstaging the music. Although the titles To My Beloved, If I were a Bird, and Rêve angélique led me to expect an hour of tepid bourgeois pieties, I found myself taking great pleasure in every note. This is an exquisite recording. Congratulations to the sound engineer, Daniel Shores, who creates a perfect salon ambience. Congratulations also to Steinway & Sons for proving once more that they make the best pianos in the world. 15. Arabesques on themes from the "Blue Danube Waltzes"